Best Biometric Gun Safe: Faulty Security for the Price? » Best Biometric Gun Safes – Faulty Security for the Price? You’ve probably been browsing the internet for a gun safe and have come across the phrase ‘biometric gun safe’. If you’re unsure about what it means and whether it’s worth your money, you’ve come to the right place. For centuries, people have used combination locks as the standard way to secure their valuables inside a safe. Recently, with the advances in modern technology, I’ve seen an increase in electronic locking systems. This is similar to putting your pin number into your phone to unlock it. Even more recently, there are ways to identify people based on their physical characteristics. This is just like using your fingerprint to unlock your smartphone. So which method is the best to safeguard your firearm? I’ll discuss all the advantages in this article. Although this biometric method seems high tech and fancy, it doesn’t come without its disadvantages. I’ll discuss not only how it works, but how reliable this method of identification really is. I’ll also share my review of this year’s best gun safes that use this biometric fingerprint method. So let’s dive in! Ready to see the deals? Click here for Amazon’s price. 1 What does biometric mean? 2 How do biometric gun safes work? 3 How reliable are biometric gun safes REALLY? 5 Which biometric gun safe is best? Biometrics is a method of recognizing an individual using their biological traits. There are many different ways to recognize a person using this method. It can recognize you with your face, your eyes, fingerprints, voice and more. In the case of the gun safes, I will be looking at today, this method will recognize you based on your fingerprint. This type of identification has been around for more than a decade. It is constantly being improved and modernized as technology advances. Because of this, it is becoming more cost efficient for people who are looking to buy this type of security. The unique thing about using this method of verification is that you don’t need to remember a password or combination. Those can easily be forgotten or stolen. With biometric technology, you can’t duplicate someone’s fingerprint because it’s specific to just that person. So in theory, this is the best way to protect against someone trying to get into something they shouldn’t. This futuristic type of identification has now been made accessible to gun safe owners. Biometric gun safes work by identifying you by your fingerprint. You may see these safes referred to as fingerprint gun safes for that very reason. The scanner does two things. First, it scans an image of your fingerprint. Then it matches the patterns of peaks and valleys in your print to the scanned images you’ve programmed it to remember in the past. The initial fingerprint that you scanned in is converted into a series of numbers. This set of numbers is stored in memory. Every time you scan your fingerprint after that, it converts it into a series of numbers and compares it to the initial fingerprint. Because it turns your fingerprint into a set of numbers, it is nearly impossible for someone to hack in, reconvert the numbers into a fingerprint and try to use that fingerprint to open the safe. How reliable are biometric gun safes REALLY? Like I said previously, there are benefits and downsides to this type of technology. Whether it’s right for you is up to your discretion. There are a few factors that will make these guns safes more reliable. They must have strong batteries in them, meaning the battery can’t be dying. A dying battery can cause a faulty reading of your fingerprint. The reader pad that is scanning your fingerprint needs to be clean, so if you are getting one of these safes, make sure to keep it clean with a Q-tip every so often. If it becomes dirty, it will have a more difficult time reading your fingerprint. If your fingerprint has changed in any way, it’s likely to not let you in. If you get a cut or scrape on your finger, it will change the shape of the print, therefore, it may not be able to be scanned. So if you have a job where you work with your hands a lot, this may be problematic for you. Ultimately you’ll want to have a backup method of opening the safe. Most safes allow several fingerprints to be recognized, so you’ll want to program all 10 of your fingers as accepted fingerprints. This means, even if the safe refuses to recognize your thumb, you’ll have 9 other fingers to use to open the safe. The only downfall I can think of where all 10 of your fingers may not scan is if you’ve been in a pool or shower and all your fingers are pruned. You may want to try this and see if it accepts your prints this way. As you can see, there are a lot of thoughts and factors that come into play when using biometrics to open your gun safe. There are people who swear by it, and others who prefer the traditional locking mechanisms. Whether you buy a biometric gun safe or a standard locking gun safe, you’re looking for a place to keep your gun secure. But what are the differences between these two types of safes? Let’s have a look. One of the primary benefits to the biometric type of locking system is that you don’t need to remember your password. In a situation where you’re rushing to get your safe open, you may be under some stress. This can make it harder to remember your combination when you need it the most. Having a fingerprint gun safe will remove that panic of trying to recall your password. This is also beneficial if you’re not planning on going into the gun safe very often. If you’re planning on storing your guns for long periods of time and don’t need to use the safe on a daily basis, it will be easier to forget your combination. Having a biometric fingerprint safe will mean you won’t have to write down your password and look it up when you want access to your safe. Because biometrics is still pretty new, they don’t have the type of performance testing and ratings that standard locking systems have. So it’s difficult to know how well the biometric lock rates without reading reviews on the product itself. With standard mechanical and electronic locks, there is a UL-rating that gives you some idea of the protection you’re buying. Currently, there are some agencies that are working on performance testing and rating systems, but these are still in progress. A benefit for the standard gun safe is that it usually comes with a cheaper price tag. If cost is something you value over the latest fad in technology, then you may want to look at more standard electronic or mechanical locking gun safes. Another benefit to the standard gun safe is the near foolproof method of unlocking when you know the code. With mechanical locks, a code is all you need to get in. Keeping the batteries fresh isn’t a concern. You also know the exact amount of time it will take to unlock the safe. You can time yourself entering the code. With the biometric gun safes, your fingerprint may fail to read, making the time to enter twice or three times as long if the safe refuses to read and accept your fingerprint. Which biometric gun safe is best? I’ll be diving deep into three different biometric gun safes. These three types of gun safes each has their own purpose besides simply keeping a gun safe and secure. Out of all the biometric safes I looked at, these three had raving reviews and features I couldn’t pass up. The Verifi S6000 is #1 by far. This is a fairly new safe on the market but has gotten raving reviews so far, so I couldn’t leave it off my list. If anything, it’s #1. Really, the reviews are out of this world and I’m wondering if there is finally a breakthrough in biometric technology that everyone can get behind. Zvetco Biometrics has done a wonderful job on this product. Here’s the box of the safe as well as my first shot of it out of the box. The safe weighs 32 lbs and it’s definitely noticeable. It’s also a lot larger than it seems in the photos. Keep reading for more photos of the inside of the safe. Below is a view of the items that come with the safe. It comes with 4 batteries, two backup keys and mounting hardware so you can bolt down your safe as soon as you get it. I got a close-up shot of the backup keys for this safe. The keyhole is nice and hidden, so it wasn’t immediately apparent that there was a way in the safe other than the scanner. I actually had to grab the instructions to figure out where to use the keys! Its biometric feature is one of the most advanced on the market today. It uses FBI certified 3D scanning that will scan below the surface of the skin. People are really going crazy over how accurate this scanning system is. No one has complained about the scanner not being able to read their fingerprints. It took me about 3 seconds to open the safe. That was from the time i pressed the settings button on the right, scanned my finger and it unlocked enough for me to open it. Check out the current price of the Verifi Safe on Amazon here. After it locks, you’ll see a close up shot of the screen. The safe gives you diagnostic information about the battery life and lets you know it is fully locked. I love this because it means you’ll actively know the life of the battery. So many other safes will just start beeping at some point and you’ll have no idea they were low on batteries. It also allows you to set up users in the system and will keep a log of everyone who entered the safe. This is great if you want to see who has gotten into the safe recently. It allows a maximum of 40 fingerprints and up to 10 fingerprints for each user. As you know, with biometric gun safes comes the concern about the battery dying on you without you knowing. Zvetco took this into account and created the safe to run on 4 AA batteries for YEARS. This is nearly unheard of with electronic safes. Every 24 hours, a full diagnostic test is performed on the safe. It will check the battery life, and if it’s low, it will notify you with a chirp and displays the current battery percentage on the LCD screen. So if you are someone who wants to know the battery life, this safe is perfect for you. The S6000 is nice and roomy. It can hold 4 pistols lying down, and roughly 6 or 7 with a rack. You can even store ammo and extra mags in the safe too. The rack is a separate purchase, though, so keep that in mind. Check out my gun safe accessories article here for some cheap racks. You can bolt this 30-pound safe down to the floor or shelf, so you can keep it securely in a specific place. It has two mounting holes on the bottom and two on the back side, so this thing won’t go anywhere. Its dimensions are 17″ x 16″ x 8″. Here are some photos of the bottom and back where you can bolt the safe down. They have a 30-day satisfaction guarantee and a one-year limited warranty on manufacturing defects. I was a bit disappointed to not see a limited warranty for replacement if it was damaged by a fire or break-in. Overall, I am highly impressed by the advanced technology with this gun safe. I would recommend it to someone who is looking for securing multiple pistols and wants a near perfect biometric reading feature. Check out the Verifi S6000 safe at Amazon to read more and buy today. This is a single pistol gun safe that boasts a unique design. The reason for the unique design is that it is extremely versatile when it comes to mounting it. It was created for a quick access situation. Many people will install these near their beds, or in an office. It’s perfect for the person that wants their pistol near reach of them, but not just stashed in a drawer where a child could have easy access to it. This safe holds up to 120 fingerprints. This means you could program all your fingers and toes. Well, I don’t really know about the toes, but if you have other members in your household, you can give them access to the safe as well without running out of available fingerprint memory slots. There is a backup override key as well, so if for some reason the scanner doesn’t seem to work, you can use a backup key as well. If you’re looking for a safe that you can access easily in the dark, this GunVault biometric safe may be the best choice for you. It’s known for its easily opening ability in the dark. You can reach over at night and have it scan your fingerprint. After that, you’ll hear a whirring noise that lets you know it’s unlocking, then the bottom portion will open illuminating your gun with a light. You can simply grab it and go. One of the downsides to this safe is that it can’t fit longer barrel pistols. 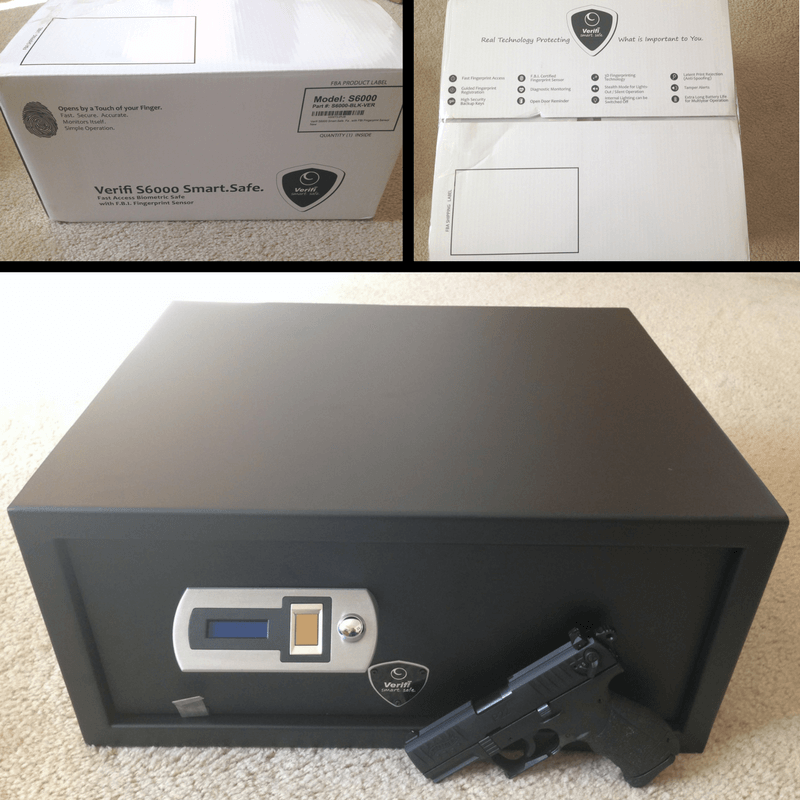 You will want to measure your gun before you purchase this safe. It can get a bit tight if your pistol is large. This safe holds standard sized pistols, but not necessarily all revolvers. I compiled a list of guns that fit here, on a review of this safe’s sister product, the SpeedVault SV500. The interior dimensions are 2¼” x 5¾” x 8½” so make sure that your gun fits before buying. If you want your gun safe to hold something other than a single pistol, you may want to look at our other reviews. This safe is reserved for the person who only wants to store an easy to access pistol. Storing extra clips in the safe might be possible by cutting out the foam, but I don’t recommend buying it if you’re looking for extra storage. There is a 5-year limited warranty available on this safe. GunVault will replace your safe if it was damaged by fire or burglary. There’s also a 1-year manufacturer warranty that will protect you against any issues with the creation of your safe. You’ll want to inspect the safe and open and close it several times when you purchase it. This will ensure you catch any issues with the safe early on. If the biometric version doesn’t seem to be right for you, check out the GunVault SpeedVault SV500 buying guide here. For someone who wants to secure their long guns yet have quick simple, easy access to them, this is a great option. You won’t need to invest several hundreds of dollars to get some basic security. This rifle safe fits two scoped rifles or up to three single barrel long guns without scopes. I don’t recommend it for anyone trying to secure more than 3 long guns. I also don’t recommend it to anyone with 30 round clips on their rifles, unless they want to rotate them inside the safe. For some larger options, check out Stack-On’s 14 gun safe review here. Its depth is only 6.3 inches. You will want to measure your guns ahead of time to ensure that they fit inside. If you already have invested in a large, expensive safe for your gun collection, you may not want to open up your entire collection every time you want to grab your most used guns. This safe gives you the option to have your favorite long guns quickly and easily accessible in a separate location. The biometric fingerprint reader is pretty accurate according to reviewers. There are backup keys in case it isn’t able to read your fingerprint. It also stores up to 120 fingerprints, which is perfect for reading all your fingers. You’ll want to bolt this safe to the floor or the wall. This adds a layer of security and will keep the 66 pound safe from tipping over. The door is fairly heavy compared to the rest of the safe, so when it’s empty it’s a bit ‘front-heavy’. If you don’t care about fire protection and simply want to keep a couple long guns secure and away from children, this is a great option. Barska offers a one-year limited warranty on this safe. I found the best price at Amazon with Prime shipping. Check it out at Amazon. Overall, biometric gun safes still have their kinks to work out. They are faulty at times depending on the quality of the scanner. It is fascinating technology and for the person who is looking for unique identifiers to unlock their safe, this is the perfect avenue. Our favorite safe out of the three is the Verifi S6000. With all the negative reviews about biometrics failing on people, I was truly amazed at how well this new product shines from all the rest. I am hoping to see more FBI approved 3D scanning in the future and look forward to these in the years to come. Check out my favorite here on Amazon. If you have any questions about either of these products, feel free to contact us. I am always looking to provide better quality information to people looking for their perfect gun safe.